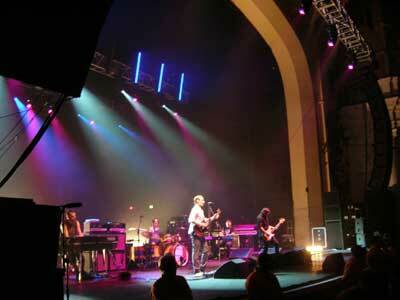 Silverchair rocked London tonight with a set list dominated by songs from Young Modern. Daniel's voice seemed to show no effects from his recent illness and seemed to hit every note. The crowd were very responsive and even the band seemed shocked at the fact that all new songs were learnt word by word even though the album isn't officially released over here yet. Support act were not great, but then again when are they!!!! I would love for the Chair to come out and just play for 3 hours and throw in some old faves instead. I thought Emotion Sickness was amazing . Daniel nailed it big time. Hearing the new songs live has given them a new dimension. Great Show guys see you again soon. All I can say really is that it was a fantastic show, the crowd was amazing..you could tell London had been itching for this for over 4 LONG years! Daniel really got us all going, and the whole band really seemed to enjoy the night. I really really enjoyed hearing the new songs live, before this show I hadn't been completely HOOKED on the new album.. not the way I usually am about new silverchair music.. Post show that is fast changing, though it was great to hear older favourites like Emotion Sickness, Ana's Song, Freak and the rest, it was the new songs I enjoyed hearing the most! The mix of albums on the setlist was pretty much what I was expecting and just about spot on. This was my 7th Silverchair show and I'm rarely let down by which songs silverchair choose to play, I'd rather they played whatever makes them happy and for them to enjoy it more, than demand them to play stuff they don't want to and maybe give up touring altogether. I've given up hope of them ever playing live a REALLY SURPRISING RARE song. When you look at reviews and see the setlist of one show from a tour they pretty much follow that throughout. That seems to be their thing and maybe that's why they get bored of those songs. None of this is meant as a slur against silverchair, more for fans to be realistic of what to expect. The ONLY disappointment of the night for me was that it was a shorter performance than I had hoped for, I thought that this being the only London date, they would play for at least 2 hours. Which only keeps me hoping that there will be another show announced. Cross fingers London! I'll be off for another fix in Nottingham tomorrow night, but it doesn't stop me dreaming! Thanks silverchair! 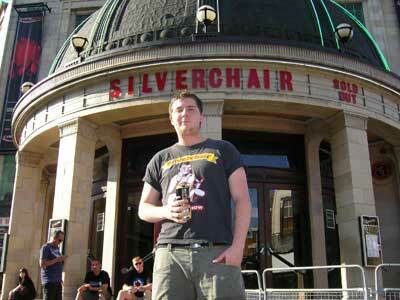 And also thanks to the fans outside who kept my friend and I company, silverchair fans are the best! Thought Id send ya a couple of photos I took at the band's Brixton show in London on Fri 10th Aug. And a little "report". Id waited 4 years to see silverchair again. I saw them on the Across The Night Tour in 2003 and was blown away. I saw The Dissociatives when they played London and was blown away by that too. So I was actually a little nervous when waiting to see them again this time around. 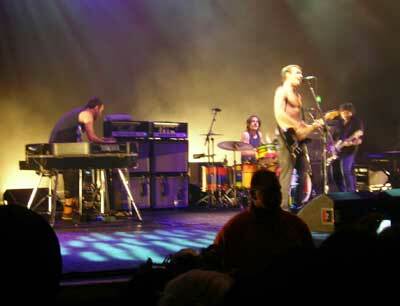 I didnt watch the first band, instead I went in 10 mins before silverchair came onstage. I will be totally honest and say that I actually cannot really remember everything that went on coz I was so lost in it and a little tipsy too! haha. While all the songs were great, the stand-out tracks for me were Those Thieving Birds (which I really wasn;t expecting!) and The Door which has always been one of my favourite songs. The band put on an awesome live show as always, and Daniel worked the crowd like a true rock star should! The only one thing thats negative that I have to say is that I really really wish the show had not been at Brixton Academy. I hate the venue with a passion and only went coz I love the band. The sound was not great at all and really let the band down, not doing their amazing music the full justice it deserves. Im glad and really pleased I got to see them for a fourth time (saw them at Reading Festival too) and I love hearing Daniel's voice, but lets just say Im glad Ive seen them in decent venues too.